Reference: Alfie Kohn, ‘NCLB and the Effort to Privatize Public Education’, in Deborah Meier and George Wood (eds) Many Children Left Behind: How the No Child Left Behind Act Is Damaging Our Children and Our Schools, Boston, Mass., Beacon Press, 2004, p. 90. 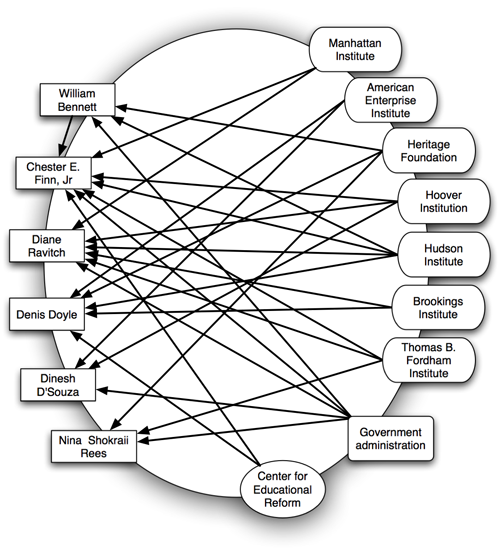 The same group of fellows are associated with various think tanks and often have experience working in government bureaucracies (see figure below). 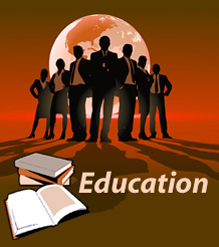 For example, Nina Shokraii Rees “helped to draft the blueprint” for the No Child Left Behind (NCLB) legislation whilst at the Heritage Foundation, then went to work in the Department of Education to help implement it. Source: Sharon Beder, This Little Kiddy Went to Market: The Corporate Capture of Childhood, Pluto Press, London, UK, 2009.